In a recent review of several movies (Five Movies to Recommend), I mentioned the name of a writer, David Foster Wallace, whom I somehow didn’t know. Or at least I didn’t know I ‘knew’ him. Thanks to an alert MillersTime reader (KC), I was reminded of an article he wrote in the now defunct Gourmet magazine in 2004 entitled Consider the Lobster. So I reread the article — I think I had never paid much attention to who authored it — and was again amused and delighted. Wallace had taken on an assignment for Gourmet to write about the annual Maine Lobster Festival, held in July in the state’s mid-coast region. No doubt taking a page from MFK Fischer’s wonderful small book, Consider the Oyster, (written in 1941), Wallace’s essay took the opportunity provided by the festival to explore an issue many of us who love lobsters and prepare them at home occasionally ‘consider’. Trust me on this one. If you’ve ever ‘considered the lobster’ and if you like the writings of Calvin Trillin and John McPhee (a high bar I know), I suspect you’ll enjoy Wallace’s Consider the Lobster. And be sure to read the 20 footnotes which are really just an extension of this amusing and delightful essay and likely the only footnotes you’ll ever read with pleasure. Rereading Consider the Lobster also reminded me about how much Ellen and I have enjoyed an annual weekend that has been centered around lobsters and friendship. 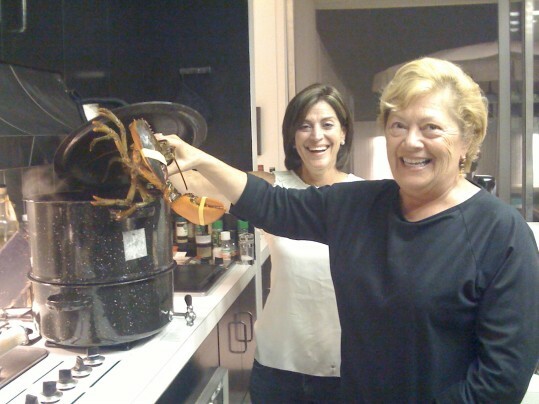 For at least a dozen years, probably much longer, Ellen and I have been spending a summer weekend with two friends (Ray & Fruzsi) at their home in southern Maryland on the Patuxent River, where in addition to enjoying each other, we indulge in a lobster feast. The four of us begin to stir as the sun begins to set across the river. Fruzsi makes her long perfected martinis and usually has some wonderful hors d’oeuvre to carry us until the big event itself. Every year at this point I say something about “this being my favorite time of day.” Ellen rolls her eyes and swats mosquitoes. I won’t go into all the details, but as you can see by the picture above, we have a lobster pot and proceed to ‘cook’ the live lobsters (Fruzsi makes some remark questioning whether the “Boys” feel any pain as they are put into the pot and seem to clamor to get out). We boil some local corn, slice very ripe local, summer tomatoes, and melt some butter. Ray produces several bottles of his carefully chosen wine, and I ‘plate’ the lobsters (picture left) after cracking the claws and making the two-pounders ‘ready’ for consumption. By now, darkness is descending. But not for us. We sit and try to remember how many years we’ve been doing this. Fruzsi remarks each year how perfect everything is and how fortunate we all are. Ray and I have already begun to work on our lobsters. It’s a long, leisurely dinner with all the warm feelings and familiarity that come with sharing good food with close, long-time friends (32+ years). Eventually we clear the table, Ray and I take out the ‘garbage’ — what’s left of the ‘Boys’, that is, the lobster shells and corn cobs –and ceremoniously walk, with Ray in the lead, the 20 yards down to the river to feed whatever lies in wait. Ray comments for the umpteenth time that some archaeologists will no doubt be dumbfounded 100s of years from now to discover that lobsters lived in the Patuxent River (note Wallace’s reference to lobsters dating from the Jurassic age). We all go for a brief walk to one end of Broome’s Island so we will have ‘room’ for our traditional peach pie desert. (We use to get the world’s best peach pie from a woman who made just a few each weekend, but she has long since passed.) One of us will refer back to the ‘good ole days’ when we had real homemade peach pies. We stack the dishes and happily go to bed. In the morning, by the time Ellen and I finally rise, Ray has put the stacked dishes in the dishwasher, Fruzsi has coffee ready for everyone and has taken the left over lobster meat (usually claw meat) and made a salad for lunch. Sometimes we agree we will walk over to Stoney’s to confirm they are still making the best crab cakes in Maryland. First, however, Ellen and Fruzsi set out on a long morning walk and to finish whatever topics were not covered the previous afternoon. Ray and I stumble around, but mostly sit in the morning cool by the pool, satisfied to simply enjoy the calm of the morning and our friendship — guys do such things differently than our spouses. Ray does keep an eye on the time as he rarely misses the Sunday morning news shows (aptly referred to, I think, as the “Sunday morning gasbags” by the previously mentioned wonderful writer Calvin Trillin). Unfortunately, this annual getting together was interrupted this year. Frozen pipes and a flood at the Broome’s Island house over the winter has led to a major rebuilding project and therefore a disruption in our annual lobster weekend. While we will no doubt pick up again next year, roughly where we left off, and some of the Fruzsi-Ellen conversations will likely involve new topics. I hope we can use Wallace’s Consider the Lobster as the basis for a more informed discussion about Fruzsi’s question regarding the lives of lobsters, whether they have feelings, and whether they experience pain when put into the boiling water. Or they like the lobsters! What a beautiful essay on ritual and its importance in our lives! Thank you! Finally, an interesting, viable, excellent reason for eating lobster. Oh, I know it tastes OK unless it is drenched in butter when it tastes as good as the butter. And I know the cracking the shell and pulling and digging at the meat gives the diner a sense of participating in the food gathering and preparation process and this confers a vague sense of being some kind of hunter. By itself, lobster is nice but as a gourmet treat, it is overrated. But, when this dining is done with great friends over many years, it becomes an important ritual which reaffirms the importance of having and being such friends. Just as with the turkey at Thanksgiving, where this somewhat boring bird is elevated into the centerpiece of an annual family gathering, it isn’t the food item that is as important as the willingness, nay the eagerness, of a group of people who care about each other to set aside the time to do this thing right, year after year. Many more happy lobster fests/feasts. As usual, you are on target. 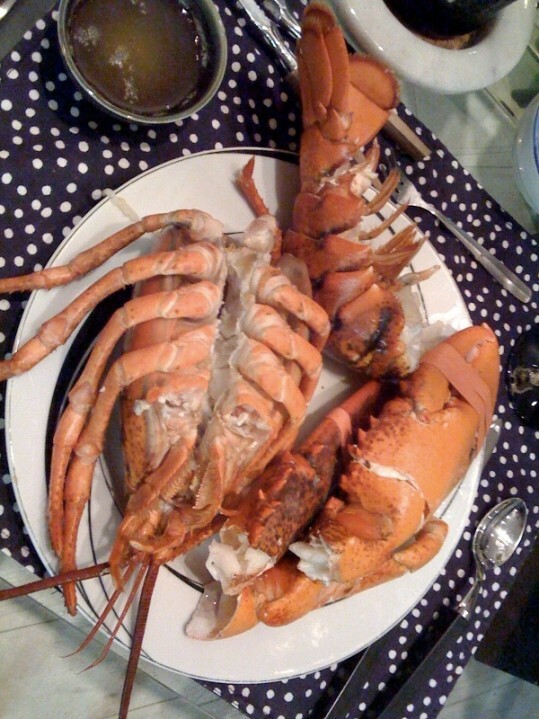 While good, lobsters aren’t a delicacy, tho a good excuse for indulging in melted butter. No doubt you also know that at one time, lobsters were fed to prisoners every day, until a law was passed that said prisoners could only be fed such a poor meal three times a week. Now, according to an article in this week’s New Yorker, lobster are again so plentiful that they have become a fast food option — McDonald’s, Subway, Costco, etc. But joining with friends in whatever reasonable wholesome traditions is worthwhile. You captured it perfectly. I have now re-read it several times, always with a smile on my face. Can’t wait for next year to resume the tradition. Thanks for the story about one of your traditions. I seem to remember of these celebrations about other occasions of your life that are important to you. While I wouldn’t say that you are a “traditional” kind of guy ( in the traditional sense) you do celebrate life which I admire. Before we sat down, my sister pulled up her crab pots off her dock, and may wonders never cease, there were three good size crabs to add to the ones’s she had purchased. I met them when they were alive in the bucket, and thanked them for their contribution as we popped them in the steaming hot water. Actually, I think crabs win the ‘better taste’ debate. And the work it takes to get to that taste is no problem if you’re so doing with friends, which, of course, is the only way to eat crabs. Thanx for adding to the post.